When a star explodes, the expanding gas, will, over thousands and even tens of thousands of years, mix with the pre-existing gas between the stars. When it does, they interact and form sheets, ribbons and filaments. 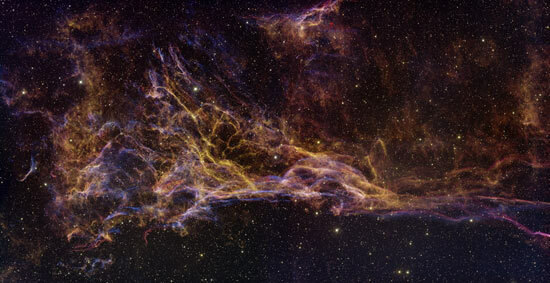 This image shows just one small section of the Veil Nebula in the constellation of Cygnus. It was made by my buddy Travis Rector, whom you may remember from my Top Ten Astronomy Pictures (he put together the image of galaxy IC 342). The picture is comprised of two pointings of a 64 megapixel camera sitting on the back end of a 4-meter telescope. I don't know about you, but my 5 megapixel camera suddenly looks a little weak. This was a press release today, and I was just chatting with Fraser and Pamela about it. There's no real news affiliated with it, but sometimes I think it's OK just to release a pretty picture and say, "Look! Hawesome!"